From left are auxiliary president and bazaar co-chair Julie Burns and JP Jewelers co-owner Kevin Hill. Absent is Mary Borte, co-chair. OSWEGO – Following the Oswego Health Bazaar some lucky community members will be wearing new jewelry donated to the event by JP Jewelers. 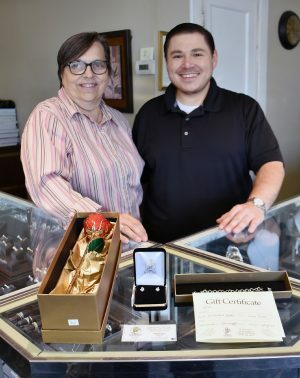 JP Jewelers has donated a pair of aquamarine and diamond earrings, a 24K gold-dipped rose and a generous gift certificate. Community members attending the bazaar on October 10 and 11 will have the opportunity to take the jewelry home. The bazaar will be held both days from 9 a.m. to 7 p.m. in the Oswego Hospital lobby. This event is the auxiliary’s major fundraiser for the year and supports Oswego Health programs and services. Homemade baked goods, themed baskets donated by hospital departments and crafts will also be available. As with past years, complete turkey and ham dinners will be sold both nights from 5 to 7 in the Oswego Hospital cafeteria. Patrons can dine in or take out their dinners. Takeout meals will be available beginning at 3:30 p.m. both days. The cost of the dinners are $11 for either takeout or eat in, $6 for kids age 12 and younger, and free for those age four and younger.